Beach Retreat is a beautiful gated condominium community in Destin, Florida. This four story low density building has 2 elevators to serve 44 units. All condos look directly out to the beautiful white sands of Destin and the Gulf of Mexico. Beach Retreat 209 has a large balcony which fronts both the living room and master bedroom. Beach Retreat has 300 feet of private beach. Visit between March 15 and October 31st and enjoy complimentary beach umbrella and chair service. 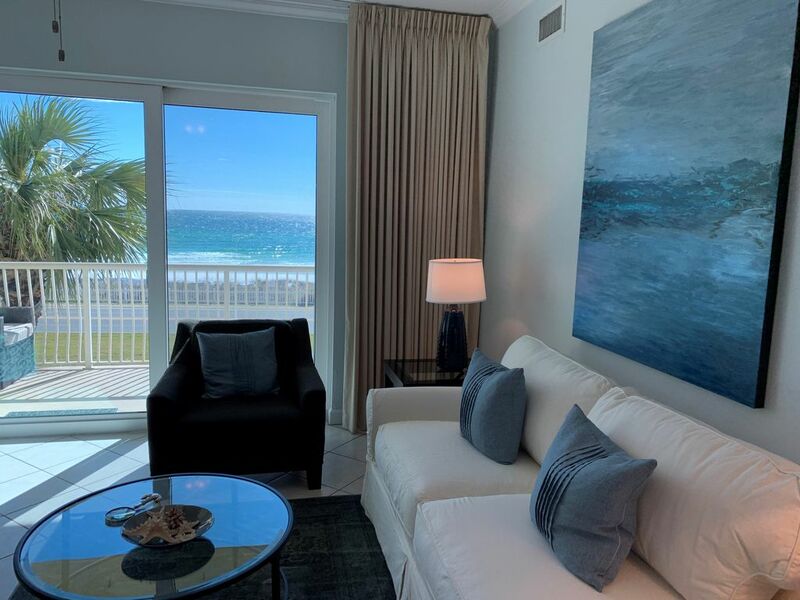 Beautiful spacious condos on the most beautiful beach in the world with a great view of the gulf, uncrowded 4 story complex with a private beach and with so much to do in the area. Pet friendly accommodations, beach service, great pool, walking/biking paths with a view of the gulf. Beach Retreat has a loyal following of guest from year to year. Come see what everyone is raving about. Property was clean and well maintained. Location and views from balcony are amazing. Balcony furniture was great. Everything in the condo was in working order and they provided lots of bath towels so we didn’t have to wash daily. This was really great because we have stayed at other places that didn’t provide an adequate supply of towels. The property was short on coffee cups and forks. We picked up some at the dollar general and left it in the unit. This had no impact on our stay. The pictures online don’t do justice for this amazing property. Also, the grounds were very well maintained and the pool area was beautiful. We also made use of the BBQ pit area also well maintained. There was also a place to walk my fur babies. We loved it and hope to be back with our fur babies. The condo is very nice, spacious, modern, comfortable and clean. The views from the balcony are great. We have rented this same unit several times. The management company is very helpful and responsive, even though we had any issues. We have rented from Beach Condos in Destin several times and will continue to do so. Stayed for spring break with two teenage girls- great location with beautiful views. Loved the decor and condo was very roomy. Beach Retreat is very convenient and I would definitely recommend this unit. The condo is beautifully decorated and appears well maintained. The beds were all big and comfortable along with all the furniture in the condo. Everything in the kitchen worked and we had a good beginning inventory of kitchen supplies. The beach is beautiful and comes with two chairs and an umbrella. The pool is very nice and has a decent amount of chairs and provides for a little warmer experience if visiting in early spring like we did. The location of the condo is good because there are a lot of restaurants and shopping centers within close driving proximity. I would stay in this condo again. Considering it is a pet friendly condo it was pretty clean except maybe the master bath was a little hairy but it wiped up easily. The only reason I did not give it five stars was because the master bedroom sliding door to the patio did not work and there were not any beach toys at the condo. At the other condos we have stayed at there were always beach toys. Overall a good vacation though next time I come it may be later in the year.